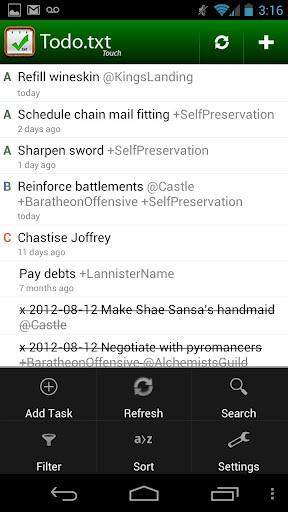 Just uploaded an extensive update to Todo.txt for Android to the Google Play Store! Todo.txt for Android now archives completed tasks, supports swipe-to-complete, has smarter Dropbox sync, and looks great on the Nexus 7. Now that the app can archive tasks to done.txt, it’s officially feature-complete, version 1.0. You can use it completely independent of the command line interface or any other desktop app or text editor. Archives to done.txt: When you mark tasks on your todo.txt as complete, the app can automatically or manually archive them to a separate done.txt file. In settings, either tap “Archive Now” to do it manually (this is my favorite method, because seeing crossed-off items in my todo list for a little while makes me feel accomplished), or check off “Archive automatically” to make the app clear away tasks as soon as you mark them complete. Supports swipe to complete: To quickly mark a task complete on your list, swipe your finger from left to right across it. To undo tasks that have already been completed, swipe across them from right to left. Reduces file conflicts: The app now references Dropbox file revision tags and does more frequent background syncs to reduce file conflicts and avoid overwriting changes on Dropbox or on your device. Automatically gets back online when your device does: We’ve completely rejiggered the app’s off-then-back online behavior so it never gets stuck in offline mode again. When your device goes offline, Todo.txt for Android keeps working offline, and when you come back online, it automatically syncs your work back to Dropbox, no need to manually turn Work Offline off. For users who want to preserve bandwidth, there is a “Manual Sync” checkbox in Settings you can toggle on and off at will. Looks great on the Nexus 7: The app now includes an extra high density icon for high-res devices like the Nexus 7 and Galaxy Nexus. Fixes project parser bug: Fixes bug where words with + in them (like URLs) used to get parsed as projects. Gets French translation: A new French translation is now available, as well as fixes to the existing German translation. Has fewer settings: By combining and reducing settings, the app now has 3 fewer checkboxes for users to fiddle with, and all the more reason to just get back to work. I’m deeply grateful to the tireless contributors who make Todo.txt go, especially the people who created this release: Chuck and Florian for adding smarter syncing and done.txt support, John for creating higher density artwork, Alex for the French translation, and to all the typo-fixers and question-askers and release candidate-testers. Read more about Todo.txt’s philosophy, check out the app, and let us know what you think.